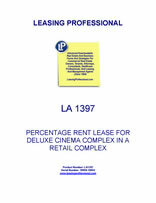 This Lease is made as of _________________, by and between COMMERCIAL PROPERTY LANDLORD, INC., a __________________ corporation ("Landlord"), and AGREEABLE CINEMA TENANT, INC., a _________________ corporation ("Tenant"). 1. Agreement to Let. Landlord hereby leases to Tenant, and Tenant hereby leases from Landlord, upon all the terms, provisions, and conditions contained in this Lease, those certain premises described in Paragraph 2.2, below (the "Premises"), consisting of a portion of that certain Shopping Complex commonly known as ___________ , in ________________ (the "Project"), along with the non-exclusive right to use, in common with Landlord, Landlord's invitees and licensees, and the other tenants and users of space within the Project, those portions of the Project intended for use by the tenants of the Project in common including, without limitation, the landscaped areas, parking areas, and driveways of the Project (the "Common Area"). 2.1. "Project": The ____________ Shopping Complex located in ________________ (see attached Exhibit "A"). 2.2. "Premises": That portion of the Project depicted and described on attached Exhibit "B", including, without limitation, both the existing building, as well as the additional building to be constructed on the Premises by Tenant as part of Tenant's Work (as defined below) pursuant to the provisions of Paragraph 5, below (collectively, "Tenant's Building"). 2.3. Leasable Area of Tenant's Building: Approximately _________ square feet including _________ square feet in Tenant's existing building (the "Existing Building"), and approximately _______ square feet in the additional building area being constructed as part of Tenant's Work (the "Adjacent Premises"). Square footage measurements are calculated from the exterior surface of exterior walls. The actual square footage of the Adjacent Premises will be field verified by Landlord's architect upon completion. 2.4.1. "Commencement Date": The date of this Lease, as set forth in the introductory Paragraph of this Lease. 2.4.2. "Initial Expiration Date": _____________. 2.4.3. Extension Rights: Yes X No ____ (See Paragraph 3.2). 2.5. "Base Monthly Rent": $________ per square foot of leasable area for a total of $___________ per month until the Adjacent Premises Completion Date (as defined in Paragraph 5.2.4, below) then increasing as of the Adjacent Premises Completion Date to $________ per month, $____ per square foot of leasable area per month (subject to adjustment as provided in Paragraph 7.2, below). 2.7. "Percentage Rent": Yes X No __ (See Paragraph 7.3). 2.8. "Tenant's Pro Rata Share": _____% until the Adjacent Premises Completion Date, then _____% (the foregoing percentage is based on ________ square feet of leasable area being added to the Premises as part of the Adjacent Premises. Upon field verification of the actual square footage of the Tenant's Building, as provided in Paragraph 2.3, above, the foregoing percentage will be adjusted if the actual leasable area if different). Except as provided in the preceding sentence, in the event the square footage of the total Project changes due to the construction or destruction of improvements within the Project, Tenant's Pro Rata Share will not be adjusted until the first day of the next calendar year following completion of such construction or destruction. Upon the first day of the next calendar year, Tenant's Pro Rata Share will adjust based upon the total leasable area of the Premises (see Paragraph 2.3) compared to the total leasable area in the Project as a whole. 2.12. Permitted Uses By Tenant: The Premises are to be used only for the operation of a first-rate multiplex indoor motion picture theater (but not for the exhibition/showing of Motion Picture Association of America "X" rated films nor for the exhibition/showing of films which Tenant determines, in its reasonable discretion, to be injurious to the reputation of Tenant or the Project or offensive to patrons) and related concessions and any other ancillary use directly related thereto and the incidental, limited (fewer than six machines) on Premises use of vending and video game machines (the "Permitted Use"). 3.1. Initial Term. The term of this Lease (the "Term") will commence on the Commencement Date, as defined in Paragraph 2.4.1, above, and will expire on the Initial Expiration Date, as defined in Paragraph 2.4.2, above, subject to (i) exercise by Tenant of any of its extension rights described in Paragraph 3.2 of this Lease, and (ii) earlier termination, as provided in this Lease. The term "Expiration Date", as used in this Lease will mean the Initial Expiration Date, any earlier date upon which this Lease is terminated by Landlord, as provided below, or, if the Term is extended, then any extended Term expiration date. 3.2.1.4. in the event that Landlord has given to Tenant two or more notices of default or a late charge has become payable under the Lease during the twelve-month period immediately prior to the time that Tenant intends to exercise such Option to Extend. 3.2.2. The period of time within which an Option to Extend may be exercised will not be extended or enlarged by reason of Tenant's inability to exercise such Option to Extend because of the foregoing provisions of Paragraph 3.2.1, even if the effect thereof is to eliminate Tenant's right to exercise the Option(s) to Extend. 3.2.3. All rights with respect to the Option to Extend shall terminate and be of no further force or effect even after Tenant's due and timely exercise of the Option to Extend, if, after such exercise, but prior to the commencement of the applicable extension term, (i) Tenant fails to pay to Landlord a monetary obligation of Tenant for a period of ten days after such obligation become due (without any necessity of Landlord to give notice thereof to Tenant); (ii) Tenant fails to cure a non-monetary default within 30 days after the date the Landlord gives notice to Tenant of such default; or (iii) Landlord gives to Tenant two or more notices of default or a late charge becomes payable for any such default, whether or not such defaults are cured. 3.2.4. Time is of the essence in connection with Tenant's rights and obligations under this Paragraph including, particularly, the timing for exercise of Tenant's Options to Extend and delivery of the Notice(s) of Election to Extend. 4. Delivery of Possession. Landlord and Tenant acknowledge that as of the date of this Lease, Tenant is occupying the Existing Building. Tenant further acknowledges that it has thoroughly investigated the area surrounding the Existing Building comprising the balance of the Premises upon which Tenant will build the Adjacent Premises. On the basis of such occupancy and inspections, Tenant hereby accepts the Premises in its current "as is" condition, and warrants and acknowledges that the Premises comply with all applicable laws and ordinances and that the Premises are in first class condition and repair. Such acceptance additionally constitutes Tenant's deemed waiver of any express or implied warranties regarding the condition of the Premises, including any implied warranties of fitness for a particular purpose or merchantability. 6.1. Permitted Use of Premises. Tenant may use the Premises for the Permitted Use specified in Paragraph 2.12 and for no other use. Any change in the Permitted Use will require Landlord's prior written consent, which consent will not unreasonably be withheld. 6.2. Compliance With Laws. Tenant must comply with all laws concerning the Premises and Tenant's use of the Premises including, without limitation, the obligation at Tenant's sole cost to alter, maintain, and restore the Premises (including Tenant's Building) in compliance with all applicable laws, even if such laws are enacted after the date of this Lease, even if compliance entails costs to Tenant of a substantial nature and even if compliance requires structural alterations. Such obligation to comply with laws shall include without limitation compliance with Title III of the Americans With Disabilities Act of 1990 (42 U.S.C. 12181 et seq.) (the "ADA"). If Tenant's use of the Premises results in the need for modifications or alterations to any portion of the Common Area or the Project in order to comply with the ADA or any other law affecting the Project, then Tenant shall additionally be responsible for the cost of such modifications and alterations, as Additional Rent. 6.3. Continuous Use. From and after the Commencement Date and throughout the Term, Tenant shall continuously and uninterruptedly operate a first class multiplex movie theater (with all theaters operating) running first-run movies under the provisions of this Lease (provided, however, Tenant shall not be obligated to operate within the Adjacent Premises until 30 days after the Adjacent Premises Completion Date) and, at all times, shall keep and maintain within the Demised Premises adequate advertising, concessions, and trade fixtures to service and to supply its patrons in accordance with the usual and ordinary practices of first class motion picture theaters in the ___________ region. Such obligation includes, without limitation, Tenant's exercise of its best efforts to secure the best quality, first-run motion picture feature films for exhibition at the Demised Premises. However, no shortage of funds on Tenant's part, nor any other financial difficulties as may be encountered by Tenant, shall be considered conditions which are beyond Tenant's control. If Tenant fails to continuously and uninterruptedly operate as provided in this Paragraph 6.3 for a period in excess of 14 consecutive days (or for at least 15 days in each calendar month) other than due to a casualty or remodeling which prevents such operation, such failure shall constitute a default by Tenant under this Lease. 6.4. Hours of Business. From and after the Commencement Date, Tenant shall continuously operate in the Demised Premises for business during those days and hours of operation customarily observed by first class motion picture theaters in the Southern ________ region. 6.5. Lines of Theatergoers. Tenant shall use its best efforts, in a commercially reasonable manner, to maintain its lines of invitees within the interior of the Tenant's Building, but shall be entitled, when reasonably necessary, to permit such lines to form in the portions of the Project approved by Landlord which are immediately adjacent to the Tenant's Building so long as Tenant uses reasonable efforts to supervise such lines so as to minimize the resulting interference with the flow of pedestrians through the Project and access to other portions of the Project. Landlord and Tenant shall cooperate in good faith in establishing such mutually acceptable locations for such lines so as to minimize such interference. 6.6. Use of Common Area. Tenant's use of the Common Area shall at all times comply with the provisions of all rules and regulations regarding such use as Landlord may from time to time adopt. In no event will the rights granted to Tenant under this Lease to use the Common Area include the right to store any property in the Common Area, whether temporarily or permanently. Any property stored in the Common Area may be removed by Landlord and disposed of, and the cost of such removal and disposal will be payable by Tenant upon demand. Additionally, in no event may Tenant use any portion of the Common Area for loading, unloading, or parking, or for any other purpose other than ingress and egress except in those areas specifically designated by Landlord for such purposes or as provided in Paragraph 6.5, above. 6.7. General Covenants and Limitations on Use. Tenant may not do, bring, or keep anything in or about the Premises that will cause a cancellation of any insurance covering the Premises or the Project. If the rate of any insurance carried by Landlord is increased as a result of Tenant's use, Tenant shall pay to Landlord, within ten days after Landlord delivers to Tenant a notice of such increase, the amount of such increase. Furthermore, Tenant covenants and agrees that no noxious or offensive activity may be carried on, in or upon the Premises nor shall anything be done or kept in the Premises which may be or become a public nuisance or which may cause embarrassment, disturbance, or annoyance to others in the Project, or on adjacent or nearby property. To that end, Tenant additionally covenants and agrees that no light will be emitted from the Premises or Tenant's Building which is unreasonably bright or causes unreasonable glare, including searchlights; no sounds will be emitted from Tenant's Building or the Premises which are loud or annoying; and no odor will be emitted from Tenant's Building or the Premises which is or might be noxious or offensive to others in the Project, or on adjacent or near-by property. In addition, Tenant covenants and agrees that no unsightliness will be permitted upon the Premises. Without limiting the generality of the foregoing, all unsightly equipment, objects, and conditions must be kept enclosed within the Tenant's Building and screened from view; no refuse, scraps, debris, garbage, trash, hazardous or toxic substances, bulk materials, or waste may be kept, stored, or allowed to accumulate except as may be properly enclosed within the Premises and which meets the other requirements of this Lease; the Premises may not be used for sleeping or washing clothes, nor may Tenant use the Premises for cooking (excluding popcorn, hot dogs, and similar concession items) or the preparation, manufacture, or mixing of anything that might emit any odor or objectionable noises or lights onto the Project or nearby properties; and all pipes, wires, poles, antennas, and other facilities for utilities or the transmission or reception of audio or visual signals must be kept and maintained enclosed within the Tenant's Building. Tenant will be solely responsible for the timely removal of all refuse, scraps, debris, garbage, trash, hazardous or toxic substances, bulk materials, or waste from the Premises and the deposit thereof in the trash containers or dumpsters to be maintained by Tenant on the Premises. Further, Tenant may not keep or permit to be kept any animal (excluding seeing-eye dogs), bird, reptile, or other exotic creature on the Premises. Neither Tenant nor Tenant's Invitees (as defined below) may do anything that will cause damage or waste to the Project. Neither the floor nor any other portion of the Tenant's Building may be overloaded. No machinery, apparatus, or other appliance may be used or operated in or on the Premises or Tenant's Building that will in any manner injure, vibrate, or shake all or any part of the Project. In the event of any breach of this Paragraph 6 by Tenant or Tenant's Invitees, Landlord, at its election, may pay the cost of correcting such breach and Tenant shall immediately, upon demand, pay the cost thereof, plus a supervisory fee in the amount of 15% of such cost, to Landlord as Additional Rent.